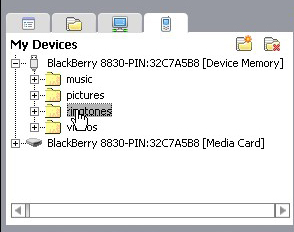 One of the most common questions upon getting a new BlackBerry device is “How do I download and install ringtones.” Well here is a step-by-step lesson that will take you from the start to finish of downloading your own ringtones and editing your profiles for your device. We've focused the tutorial around CrackBerry.com's Awesome FREE Ringtone Gallery. I hope to make it easier to understand the different ways you can download or create your own ringtones, and also how to edit your profiles and notifications for your calls, emails, sms etc. Many sites have made this extremely easy for BlackBerry devices. Since we can utilize tones in the MP3 format, there is no need to pay for tones or convert them in any way. Any MP3 format file may be used as a ringtone on your device. 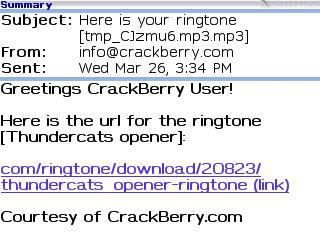 To start downloading, head over to the CrackBerry.com Ringtone page. Here you may browse through multiple categories/genres of ringtones and find one that you like best. 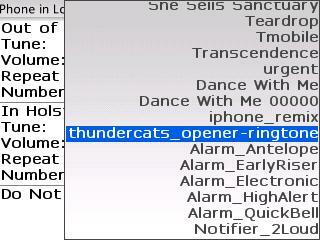 I chose the newly added “Thundercats Opener” (one of my favorite shows). 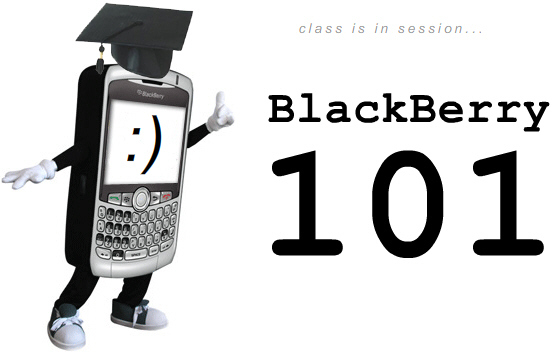 First off, make sure you are logged in to CrackBerry.com (if not, click “login” in the upper right corner of the page). For this part, we will walk through using a custom ringtone for the device’s default call ringtone. We will download a ringtone and have it sent straight to the device. 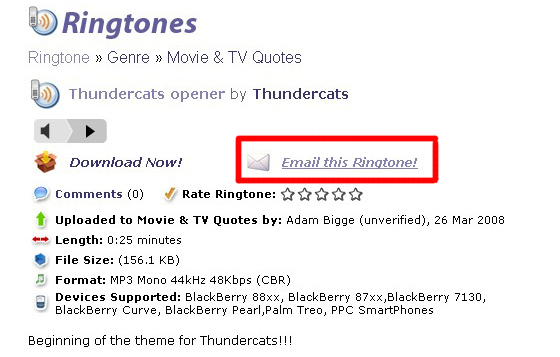 We start by selecting the ringtone to download, after clicking on it you will be brought to the details page. 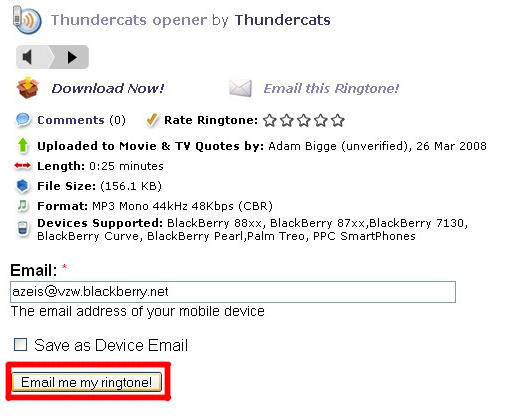 Click “Email Ringtone”. The next page will allow you to enter the address to email the tone. This should be an email address associated with your device, as you will receive a link to download the tone through your mobile browser. You will receive an email on your device with a link to download the tone. Open the email, highlight the URL and select “Get Link”. Alternatively, if you cannot click the link in the email (depending on your email viewer, 3rd party apps etc.) you may highlight the URL, copy it and paste it into your mobile browser. Note - if for some reason you do not receive an email from CrackBerry.com (and the site says it has been sent), check your junk folder. If that doesn't work, you may want to try sending the ringtone to another address (your gmail or hotmail) and forwarding to your BlackBerry from there. 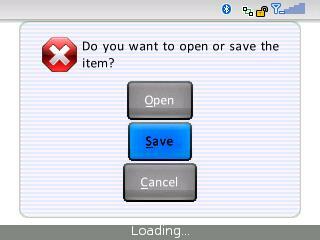 A page will open in your browser and ask you if you want to open or save the item – choose “Save”. You will be presented with an option to choose where to place your file. You may put it on your device in the ringtones folder, however the best option to conserve device memory would be to save it on a memory card if you have one. A download screen will appear. When the file shows “completed” exit your browser and return to the home screen. Next we will set the new tone as the default ringtone for the Loud profile. From the home screen, select the “Profiles” icon and scroll to “Advanced”. Then highlight loud, hit the menu key and select “Edit”. We are now in the edit screen for all of the alerts associated with the Loud profile of the device. For this instance we are only setting the ringtone, so scroll down to “Phone” and select it. From here, we have the option for “Out Of Holster” and “In Holster”. These are two often confused options. “Out of Holster” means the device is not in a holster, or case, or any sort totally naked. “In Holster” means the device is in a holster or case – covered. When the device is ‘In Holster”, a small magnet in the case signals the device for a different lot of settings. (Not all cases have magnet that will signal the device). 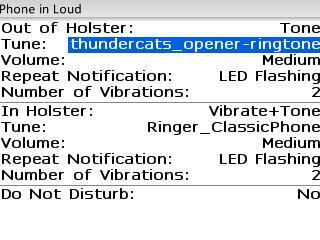 So you can pick and choose to have the device louder when in the holster, or simply vibrate. The choice is yours. For now we will set the “Out of Holster” tone. Scroll to Tune and select it. You will be presented with a list of all the tones on your phone. Scroll until you locate the new tone (usually alphabetically) and select it. Your ringtone is now selected. A few more things to make sure everything is good to go. Next to “Out of Holster” there are four options. Choose one depending on how you would like your phone to ring. For this instance we select “Tone” which will cause the device to ring an audible alert with no vibration. Set the “Volume” for the tone (High, Medium or Low). Set the Repeat Notification to either “LED Flashing” or “None”. 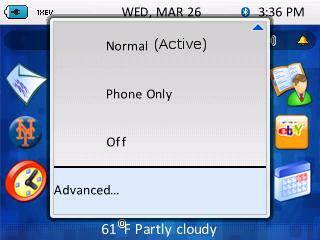 From here, press menu button and select “Save”. Your new ringtone is installed and ready to go! To add the tone for other profiles (quiet, normal etc.) Take the same steps, only edit the profiles for your liking, perhaps changing the volume, vibration etc. These steps are the same for all the alert settings on the device. SMS, MMS, Email etc. 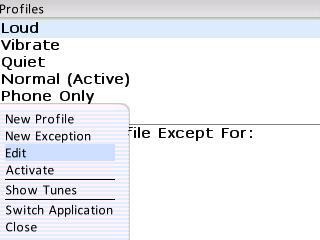 Simply edit the profile you wish to change and go through the same steps to set the chosen alert. There are two ways to do this – either through the supplied Roxio Media Manager, or by simply dragging the file to your device if you have mass storage mode enabled. For Media Manager, we can start with the same steps as when downloading a ringtone from the mobile device, however this time instead of “Email Ringtone”, select “Download Now!”. Save the MP3 file to your desktop (or any folder you choose). 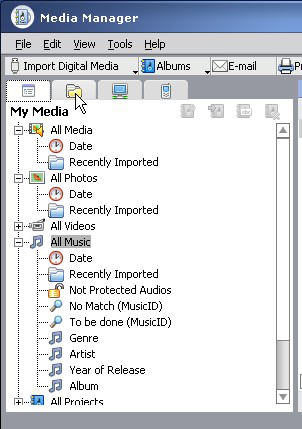 Open The Desktop Manager and load the Media Manager. 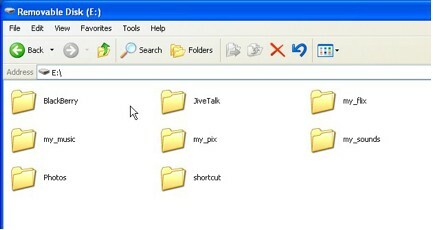 When media manager options, select the “Folders” tab to view the files on your PC. 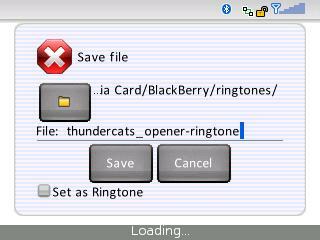 Scroll to the folder containing the downloaded ringtone (in the case “Desktop”) and select it. Now in the bottom left pane, scroll to your ringtones folders on the device (or on the memory card, depending on your choice) and select it. Now simply click “Copy Down” and you will be prompted on how you want to convert the file. Select “Convert for Optimal Playback” and click ok. The file will transfer to your device. Your ringtone is now installed and you’re ready to go. Perhaps the easiest way to get ringtones onto your device is to have a memory card installed and enable Mass Storage Mode. To do this, install a memory card into your device. Go to Options > Media Card. 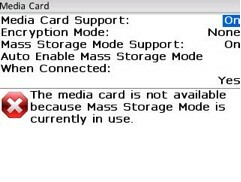 Here you need to enable Mass Storage Mode by changing the option to “On” & also change “Auto Enable Mass Storage Mode When Connected” to Yes. Now when you connect you device to your PC a dialog will pop up and ask you what you’d like to do. Select “Open A Folder to View Files” and you’re memory card will display all the folders on it. Now simply drag the ringtone you downloaded from your PC into the ringtones folder. And that’s it! The ringtone is ready to go! Now, if you choose to remove any ringtones, you can do so by navigating to your ringtones folder on your PC. Simply delete the files from the folder and they will be gone. You will need to do a battery pull in order to remove them from your list of ringtones however. Take the steps above to set the tone for your alert for each profile. Unfortunately there is no easy way to edit all your profiles at once, so if you plan on using more than one (Loud for home, Quiet for work etc.) you will have to edit them each one by one to change the tones, volume, vibration etc. This method also works for any MP3 files you have on your PC. You can download them from other sites, or maybe just rip them from your own CD collection (its hard to find a good Tesla tune online these days). That’s basically all there is to getting custom ringtones on your device - either by downloading them directly to the device, or loading them from a PC via Media Manager or Mass Storage Mode. These steps apply to choosing and setting a tone for phone, emails, sms, mms, alarms, calendars etc.